CALGARY — Curtis Lazar's hockey career needs a jumpstart. He believes the Calgary Flames can apply the booster cables. The 22-year-old forward from Salmon Arm, B.C., was the centrepiece of Calgary's trade-deadline deal with the Ottawa Senators on Wednesday. The Flames sent defenceman Jyrki Jokipakka and a second-round draft pick this year to Ottawa for Lazar and defenceman Michael Kostka. "You look at the possibility and the future I can have with the Flames and I couldn't be more excited to get there and start my adventure in Calgary," Lazar told The Canadian Press en route to the Ottawa airport. "I like the young core of players they have. I want to go there and try and complement that group. They're in a dogfight for the playoffs right now. I think I can help out and hopefully I can do that and help them make the post-season." Diagnosed with mononucleosis in training camp, Lazar was playing catch-up this season. He was assigned to Ottawa's AHL team in Binghamton, N.Y., to start the season where he had three goals and an assist in 13 games before he was recalled. With just one assist in 33 games and a minus-10 rating in his third season in Ottawa, Lazar was a healthy scratch in recent games. He needed a change and Senators general manager Pierre Dorion agreed. "We all saw that it wasn't working out with Curtis this year," said Dorion. "We just felt that (it was) giving him a fresh start, new opportunity and at the same time we were looking to improve our defensive depth and adding a high pick in this draft." The trade reunites Lazar with former Senators head coach Dave Cameron, who is in his first season as a Flames assistant to Glen Gulutzan. 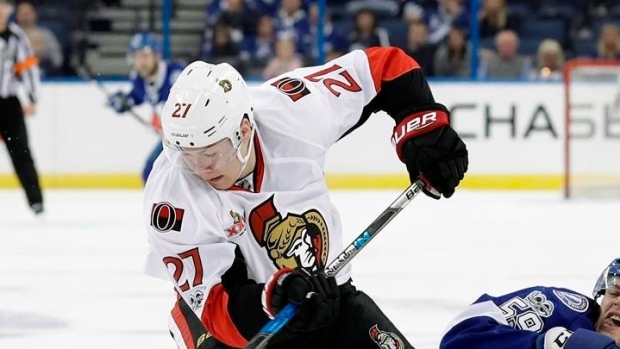 The six-foot, 209-pound forward has a career 12 goals and 24 assists in 176 games for the Senators. Lazar is in the final year of his entry-level contract and will be a restricted free agent after this season. The 17th overall pick in the 2013 NHL draft won a Memorial Cup with the Edmonton Oil Kings in 2014 and was captain of the Canadian junior team that won a gold medal in 2015. Acquiring Lazar, a right-handed shot who can play both centre and wing, and 31-year-old Kostka were depth moves by the Flames. "We're not making this bet based on what he's doing today," Flames GM Brad Treliving said of Lazar. "We think there's significant upside. With the character of this kid, he's going to put the work in. "He really fits in with our age group here. This was a long-term play for us." The Flames are on a roll. Calgary (34-26-4) collected 21 points in a dozen games in February to put them firmly in playoff contention. The Flames hold down the top wild card spot in the Western Conference just two points back of Anaheim and four back of Edmonton sitting third and second respectively in the Pacific Division. "A lot of today is about the belief we have in our group," Treliving said. "We've seen signs of this team coming together. We've got a good chemistry and mix going right now." Needing blue-line reinforcements, the Flames got ahead of the deadline obtaining 26-year-old Michael Stone from the Arizona Coyotes last week for a third-round draft pick this year and a conditional fifth-rounder in 2018, as well as signing Matt Bartkowski on Feb. 16. Stone is also scheduled for restricted free agency this summer. The Flames are 5-0 since the insertion of the two new defencemen into the lineup. "Part of why we did what we did the defencemen a couple weeks ago was we had 10 points at stake before the deadline happened," Treliving said. "Rather than wait until today, we thought those were some points they could help us get." Calgary's players had the day off after a 2-1 overtime win over the Los Angeles Kings the previous evening. Six points back of Calgary, the Kings will have former Flames captain Jarome Iginla in their lineup when they return to the Saddledome on March 19. Los Angeles acquired the 39-year-old, who was Calgary's captain for almost nine seasons, from the Colorado Avalanche on Wednesday for a conditional fourth-round pick in 2018. The Flames face the Kings three more times in their remaining 18 games.